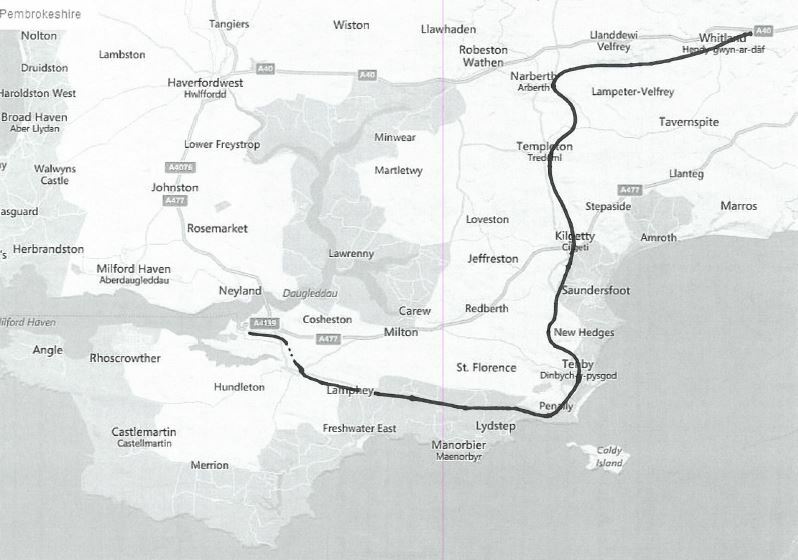 Pembroke and Tenby Railway authorised to build a standard gauge line between Tenby and Pembroke Dock. Line opened between Tenby and Pembroke. Opened through to Pembroke Dock. Extension from Tenby to Whitland opened. First goods train through to Carmarthen using running powers over the Great Western Railway, who converted the Up line by moving the inner section of the broad gauge track to make it standard (or in their mind – narrow) gauge. There was a crossing loop just for broad gauge trains at St Clears. First passenger through train to Carmarthen. Pembroke and Tenby Railway leased to the Great Western Railway. Pembroke and Tenby railway amalgamated with the Great Western Railway. For the Pembroke & Tenby Railway. Pembroke and Tenby Railway. Morris, J.P. 1976. The Railways of Pembrokeshire. Parker, Richard, Noodle Books. The Pembroke and Tenby Railway. Connop Price, M.R. Oakwood Press, 1986. WRRC Journal Volume 1 No.1. The Admiralty extension at Pembroke Dock. WRRC Journal Volume 1 No.10. Pembroke and Tenby addendum. WRRC Journal Volume 2 No.7. By LNWR to Pembroke Dock. Notes prepared by Paul Gilson.